Test ones reflexes with a Buck Hammer. The Buck Hammer has two rubber headed hammer tips plus a soft brush and sharp needle hidden in its handle. The Buck Hammer is a medical instrument designed to test ones reflexes. 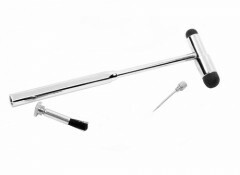 In medical play the Buck Hammer provides many options for stimulating the patient. Each Buck Hammer features two rubber tipped hammer heads, a sharp needle that is stored in the hammer head and a small brush that is stored in its handle. This instruments potential shines with a blindfolded patient and a creative doctor or nurse that pokes, prods and runs the brush over the patients body making them guess where and what will come in contact with them next. Buck Hammers are a very versatile medical toy that presents the doctor or nurse with a variety of options. Each Buck Hammer has both a 3/8 inch and a 1/2 inch rubber hammer head for testing reflexes at the elbows and knees. Additionally, they have a sharp needle stored in the head of the hammer which can be used to get a immediate and impress response anywhere on the body, while the soft brush that comes in the handle of the hammer can tease and torment the patient.